I am a messy person. I can’t stand it when my room is clean. I love it when my table is overflowing, it makes me feel that I am doing something important. Cleanliness is a habit which I need to practice. I am not proud about being messy but, I never appreciate a person for being clean. It’s a individual’s character and no one has got any rights to comment unless you are sharing the room. Once a cat decided to make my room its home and I realized this almost after a month. After that incident, I clean my room once in a week. My aspect of a clean room is far away from a real clean room. I have a medium-sized room with a big double cot bed at one corner, a wall full of shelves and another wall full of cupboards. I don’t use shelves instead I use one side of the bed. So you can imagine how messy it will look, but it’s so convenient. You will have everything in reach, sitting right on the bed. 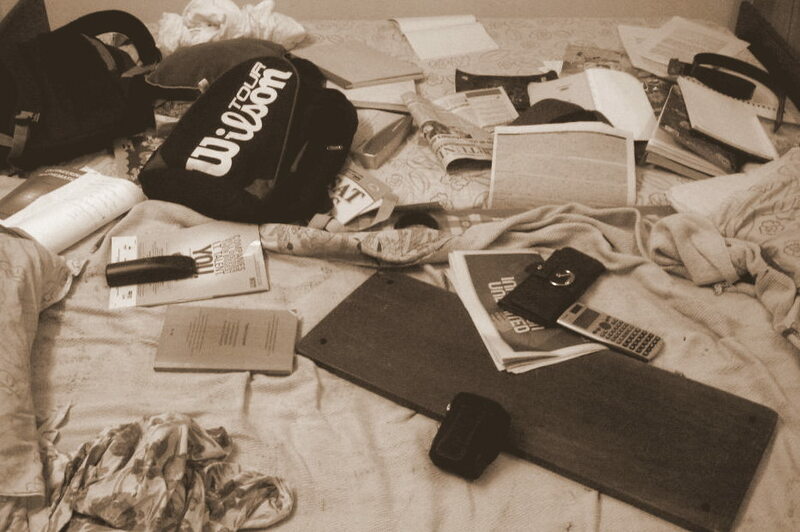 This is how (pic) my bed is right now and I clean it only on Fridays. My messy behavior, started infecting my inbox also. This drives me crazy at times, especially when a friend says “I send you a mail 2 weeks back and you didn’t respond”. Right now, my Gmail inbox contains 416 mails and I kind of feel its clean enough. So, if you are planning for a visit to my room, let me know two days back so that I can clean it up or please don’t criticize, it is my life choice. I like it messy and I feel scared to move things if its well-ordered. I keep on forgetting which goes where. So being messy makes my life simple and light.